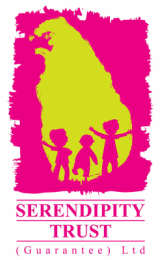 In July 2013 the Galle Children’s Festival in partnership with the Japanese International Cooperation Agency held two special events for students from selected schools in the Southern Province. Nihon De No Ichi Nichi (One Day in Japan) offered participants an exciting opportunity to discover the cultural delights of the Japanese culture while learning traditional arts, language and cooking skills. The first event was held on 11th July 2013 at Kithulampitiya Ananda MV with 6 schools attending. The 120 participants enjoyed a carousel of cultural workshops as well as an informative presentation on JICA’s projects in Sri Lanka. The day ended with a special dancing performance from the JICA Volunteers. 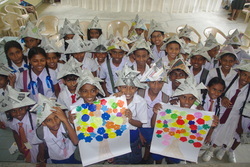 On Friday 13th July 2013 the event was repeated for children from schools in the Tangalle area. This event was held at Deepankara Primary school and another 120 children participated. They had a great time learning Japanese calligraphy, cooking Japanese food and also making some great animals and hats following the ancient tradition of Japanese Origami. The second day ended with singing some fun Japanese songs. Special thanks to all the staff and volunteers who helped make these events possible and to the Japan International Cooperation Agency for taking the time to travel from all parts of Sri Lanka to work with the students from Galle and Tangalle.